Emerging from the cold of winter and welcoming the warmth of the spring sun brings many outdoor adventures and activities for me and my family. The weather is beautiful and the air has a fresh scent of life to it. My backyard connects to a large park that has amazing running paths in it. Now that is it spring, on any given day, I can put on my shoes, grab my jogging stroller, and hit the trails. Sure, it sounds nice, and most days it is, but one key accessory had been missing from my jogging stroller. This caused times when my baby was left uncomfortable due to the exposure of the outdoor elements, such as the wind, pollen, bugs, and the harshness of the sun. That accessory was the Evolution Cover by Petit Coulou. Petit Coulou provided me the Evolution Cover so I could form an opinion and share it with you. Regardless of this arrangement, I was not required to give a positive review. All opinions expressed are my own honest thoughts. The Evolution Cover is compatible with nearly every type of three and four wheeled strollers. It is very easy to attach and offers protection from the wind, rain, UV rays, and bugs, all while keeping your little one comfortable and capable of enjoying the beautiful surroundings of Mother Nature. The Evolution Cover has provided me with peace of mind because I no longer have to worry about unseen bugs bothering my daughter’s face as we run by the lake, a strong breeze taking her breath away, harsh sunlight touching her skin, or a light rain fall from dampening her and her blankets. 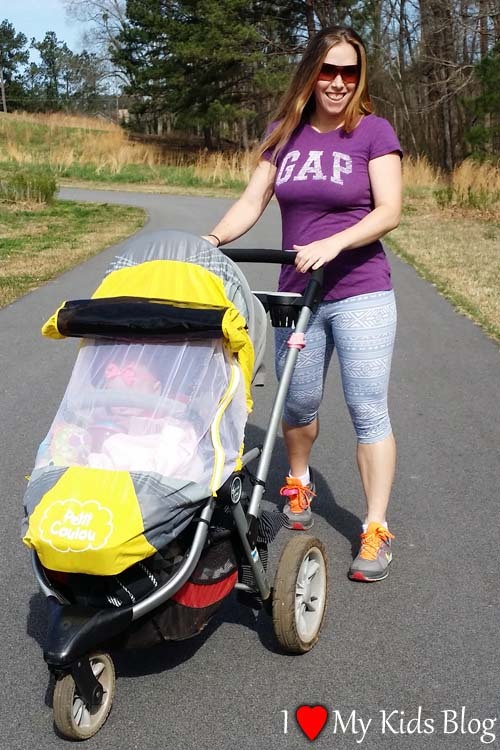 Since the Evolution Cover is compatible with both three and four wheeled strollers, I can take it with us anywhere we go without having to worry about which stroller we have in our car. The Evolution Cover is very light weight and comes in a small carrying case for easy storage and mobility. Whenever I leave the house with my stroller I always have the Evolution Cover with me as well. I absolutely love it. I can install it onto the stroller in under a minute, which comes in handy when that unforeseen rain cloud begins saturating everything around you. I don’t mind getting wet, but keeping my baby safe from the elements is one of my highest priorities. Along with the features already mentioned, it also has a side zipper for easy accessibility to your wee one. I highly recommend the Petit Coulou Evolution Cover for anyone who spends a lot of time outdoors with their strollers. It truly is a must have item. Have you ever been out walking, running, or at an event where the Evolution Cover would have come in handy? 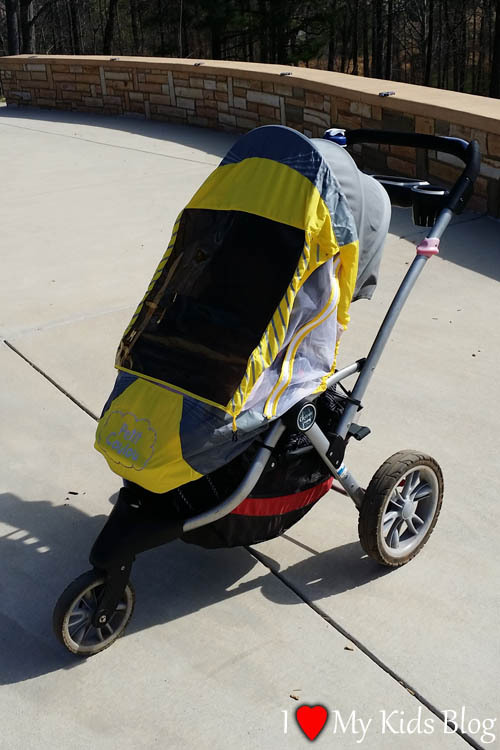 Leave a comment telling us how this will improve your outdoor experiences using your stroller.